Desert Spring Collection Fiberglass Fountain. For Indoors or Out. Stuff Points: Earn 245 points when you buy this stuff. This is the large version of this fountain. If you are looking for a smaller one, or one that costs less, then check out the medium or small size. This larger outdoor fountain is made from polyresin, so it is lightweight, but also has the look of natural stone. It is still incredibly durable, but you can set it up and move it around easier, and it is substantially more affordable. All the necessary parts are included, and it requires very little set up. You only need to plug it in and add water to start enjoying the relaxing sounds of running water inside or outside your home. This model is designed to withstand the demands of outdoor use, but would work just as well inside if you wish. Thanks to natural coloring, and a relatively small footprint, this model can be easily placed almost anywhere. It blends nicely with existing landscape and decor due to a monotone color scheme, allowing the vibrant colors of your garden or interior decor to pop even more. Improve the look of your outdoor space by adding one of these relaxing outdoor fountains. It is completely self contained, and is incredibly easy to set up. You don't need any outside water source because it will continually cycle the water you add to it. Everything you need is included with the purchase, so you will be up and running right away. Water will pump up the middle of the fountain, and then flow out of a hole at the top. The dimples around the outside of the sphere enhance the effect as the water begins to cascade and ripple over the edge. The circular details not only add a great look, but also enhance the sound generated by this model. Once the water falls all the way down, it is collected in the basin below to be reused and pumped back to cycle again. It creates a calming background noise that will relieve tension and block out unwanted sounds. Turn your outdoor space into the relaxing sanctuary you always wanted with this high quality fiberglass fountain. Order Yours Today! 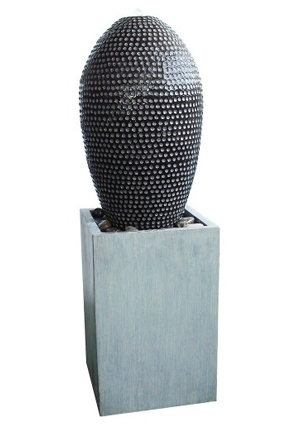 Large Polyresin Sphere Fountain - A high quality outdoor fountain made from fiberglass resin. Perfect for any space outdoors or in!Order Yours Today!